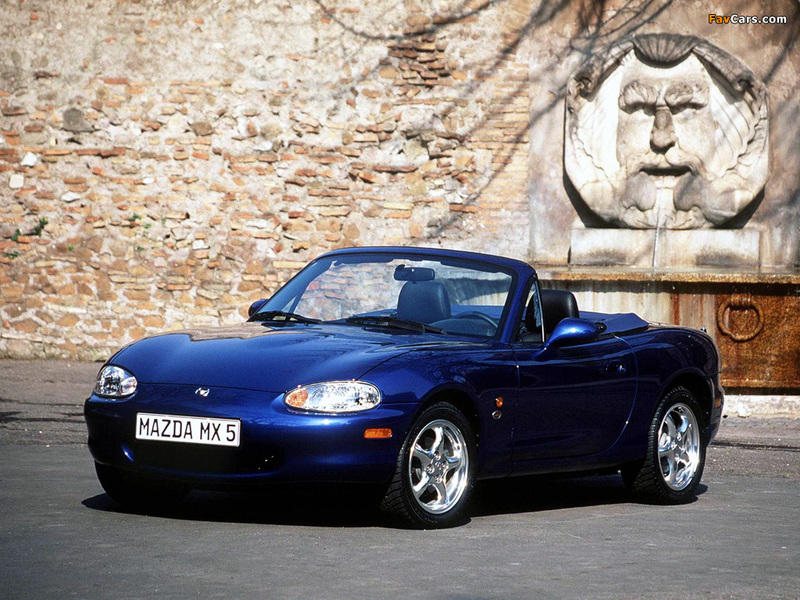 The redesigned MX-5 was previewed at the Tokyo Motor Show in October 1997. 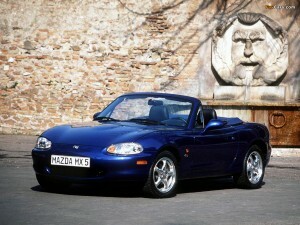 In February 1998, Mazda released the second-generation MX-5, production code NB, for the 1999 model year. 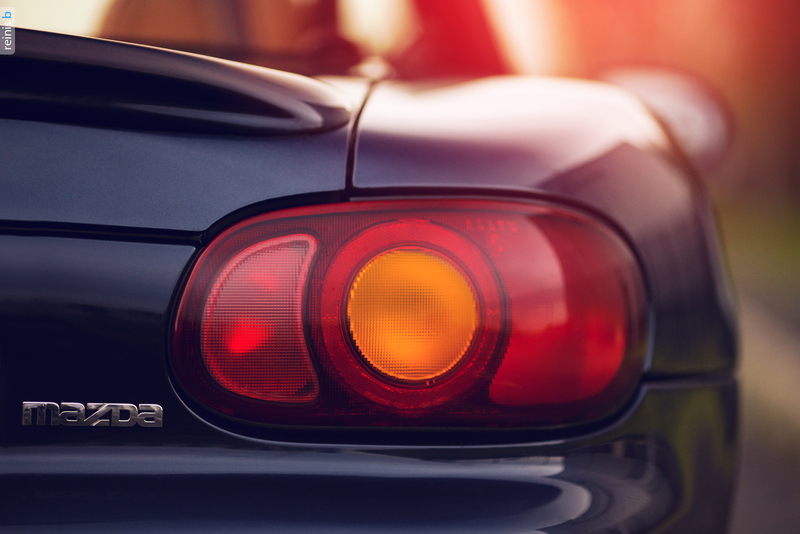 The NB featured a more powerful engine and external styling cues borrowed from the third generation Mazda RX-7 model, designed in 1995 by Tom Matano. 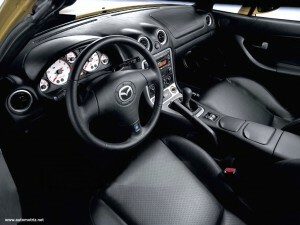 Prices in the United States, the main market for the MX-5, started atUS$19,770. Although many parts of the interior and body were different, the most notable changes were the headlamps: the first generation’s retractable headlamps no longer passedpedestrian safety tests and were replaced by fixed ones. The new car grew slightly in width compared to the earlier model; its dimensions were: length 3,945 mm (155.3 in), width 1,678 mm (66.1 in), height 1,228 mm (48.3 in) and wheelbase 2,265 mm (89.2 in). Without options, the NB weighed 1,000 kg (2,200 lb). The new generation was slightly more aerodynamic than the original, with a Cd figure of 0.36. The NB continued to employ four-wheel independent suspension, with enlarged anti-roll bars at the front and rear, but the wheels, tires and brakes were significantly upgraded: anti-lock braking system was offered as an option; alloy wheels were now 14 in (360 mm) or 15 in (380 mm) in diameter and 6 in (150 mm) in width, depending on the trim package; sports models were equipped with the larger wheels and 195/50VR15 tires. The BP-4W engine remained at 1.8 L (110 cu in) but received several minor updates. The engine compression ratio was raised from 9.0:1 to 9.5:1 by adding slightly domed pistons; the intake cam was changed to a solid lifter design with a stronger cam; the intake runners in the head were straightened and the intake manifold was mounted higher up. 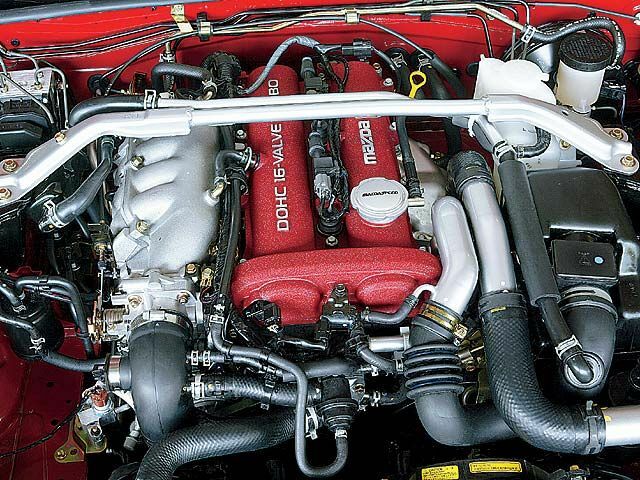 Mazda’s Variable Intake Control System was introduced, which effectively gave a long narrow intake manifold at low rpm for better swirl, changing to a short, free-flowing manifold at high rpm for maximum breathing. Power output of the new engine was quoted at 104.4 kW (140.0 bhp) with 116 lbf·ft (157 N·m) of torque. 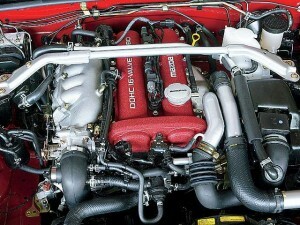 The 1.6 L (98 cu in) B6 engine remained available in Europe and Japan. The base-model 1.8 L (110 cu in) NB could reach 62 mph (100 km/h) in 7.8 s and had a top speed of 130 mph (210 km/h). 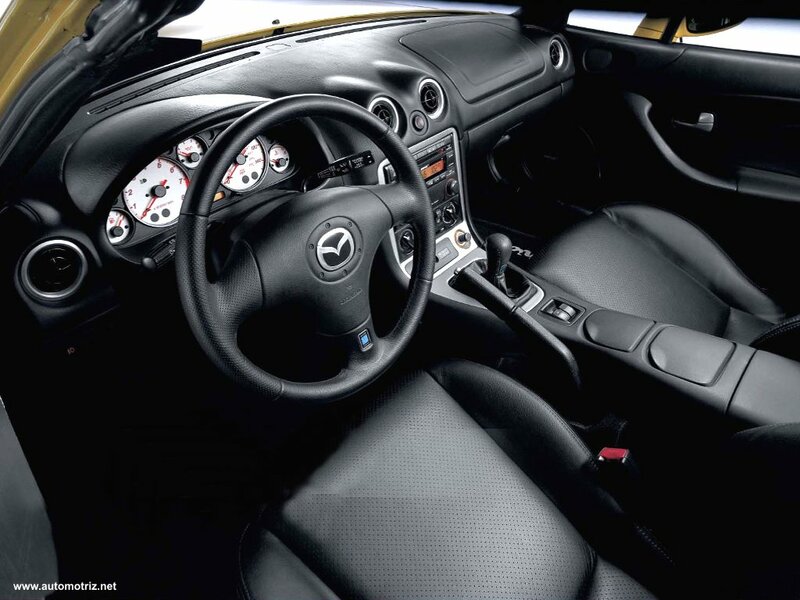 The 2004 model year saw the introduction of the official turbocharged Mazdaspeed MX-5, Roadster Turbo in Japan. It featured an IHIRHF5 VJ35 turbocharger equipped variant of the BP-4W engine that produced 180 bhp (134 kW) at 6000 rpm with a front-mounted air-to-air intercooler. The Mazdaspeed could reach 60 mph (97 km/h) in 6.2 seconds but had a top speed of only 203 km/h (126 mph) due to its low 6,500 rev limiter.With its upgraded suspension and wider tires, the Mazdaspeed model could pull over 0.98 g in lateral grip. Other features included upgraded 6-speed transmission and clutch assemblies, upgraded drivetrain components, Racing Hart 17 in (430 mm) alloy wheels, special interior trim. The 2004 Mazdaspeed MX-5 was only available in Velocity Red Mica and Titanium Gray Metallic for the US-market and Velocity Red Mica for the Canadian-market while the 2005 model was available additionally in Lava Orange Mica and Black Mica in the US-market, with Canada receiving only Titanium Grey Mica. Of the 5,428 Mazdaspeed MX-5s produced during model years 2004 and 2005, 4,000 were produced in 2004; the 2005 production run was shortened to only 1428, due to a fire at the production facility. This model was also marketed in Australia as an MX-5 SE without any Mazdaspeed branding (exhaust tip excluded), featured 3.63 diff gears and was available in Sunlight Silver as well as Velocity Red Mica, Titanium Gray Metallic and Black Mica for 2005. It was also slightly detuned with only 121 kW (162 bhp). Boost pressure was 7.25 psi (0.5 bar) for Australian model vs 8.5 psi (0.6 bar) of the North American and Japanese models which is the main contributor to the power difference. The MX-5 SE has been used for both gravel and tarmac rallying in Australia, showing the versatility of these cars in racing.